Duke Johnson converts a two-point conversion for the Browns. It may be long overdue, but it appears that the NFL has finally learned to stop worrying and love the two-point conversion. Or at least that’s the leaguewide trend through four weeks in 2018. Three full seasons have passed since the league moved its extra-point distance to the 15-yard-line, making kickers boot the ball 33 yards for a PAT instead of the old, nearly automatic 20-yard distance. But head coaches seem to be embracing the trade-off between kicking and going for two more than ever this season. 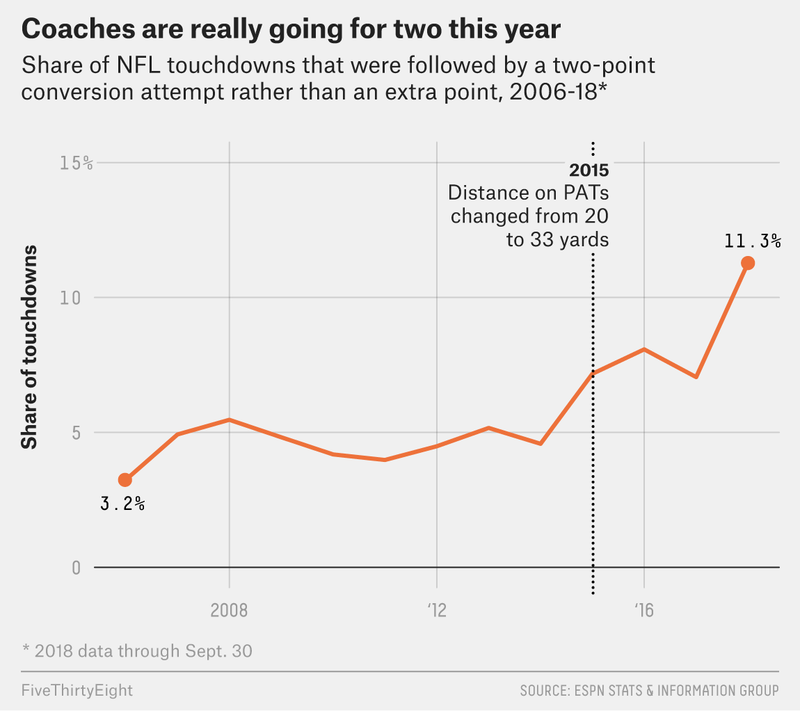 After they eschewed the extra point 14 times on Sunday, coaches have now gone for it after 11.8 percent of their touchdowns so far,1 which (according to Pro-Football-Reference.com) is the highest rate for the first four weeks of any NFL season since the 1970 AFL merger. But maybe a better explanation is the fact that two-point conversions are working really, really well so far this year. When teams go for two, they’ve gotten into the end zone 63.2 percent of the time, which easily tops the success rates from any other season since 2006.2 Remember that if the baseline accuracy rate for a regular extra-point is roughly 95 percent, a two-point conversion needs to succeed only 47.5 percent of the time to break even. So at 63 percent, the decision to go for two practically becomes a no-brainer! Of course, sustaining that 63 percent conversion rate will be pretty much impossible going forward. Prior to 2018, the league hadn’t even cracked 50 percent in any season since 2012. But the way in which teams are finding the end zone on conversions might offer some path toward sustainability. Two-point passes are being converted at a rate of 56 percent, up from their post-2005 average of 45 percent. And an even bigger leap has happened on runs, albeit in a small sample of 11 plays: 82 percent of two-point rushing attempts have found paydirt this year, way up from the historical average of 54 percent. Throw in gadget plays like Cleveland’s co-opted “Philly Special” during the Browns’ Week 3 win over the Jets, and teams may be only scratching the surface of their potential on two-point conversions early this season. After a few years of tinkering under the new rules — and perhaps a newfound willingness to accept perceived risks, following the influence of aggressive play-callers such as the Eagles’ Doug Pederson — coaches are finally starting to see the benefits that a second point after a TD can bring. Who knows? Maybe it won’t be long before we have to retrain ourselves to count in increments of eight, not seven, while doing the mental math of football. The first season of ESPN’s detailed play-by-play data. Dallas’s Dak Prescott is the only QB to try a two-point run this year.